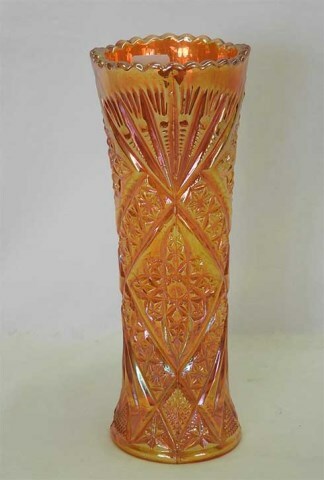 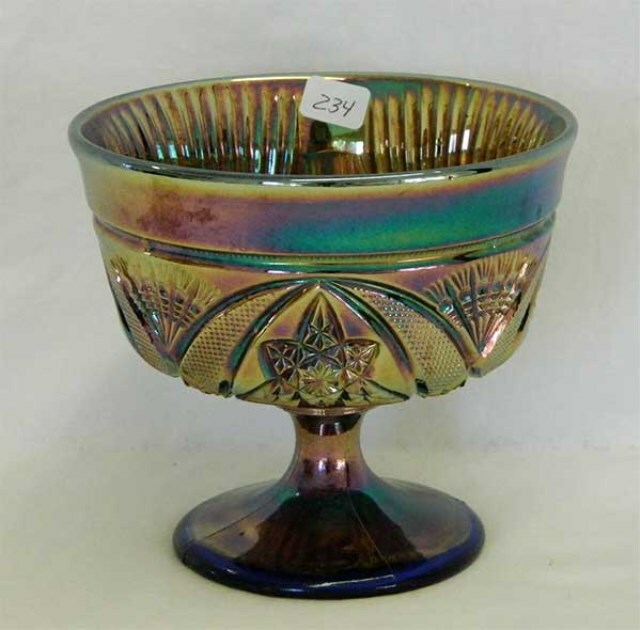 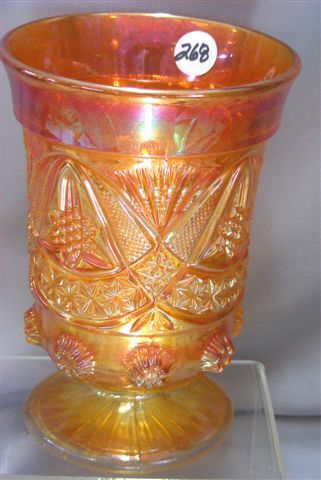 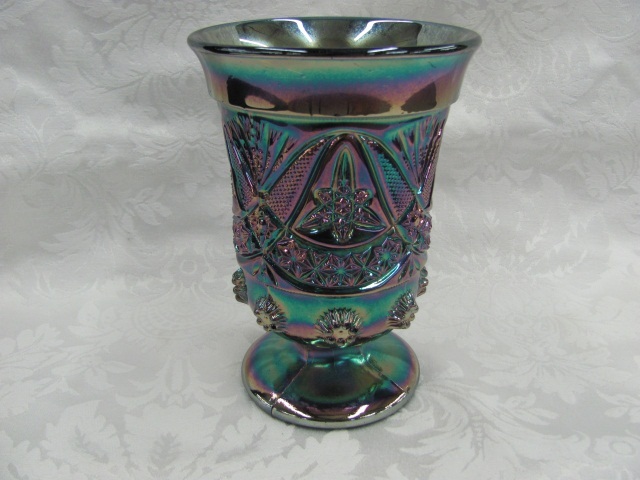 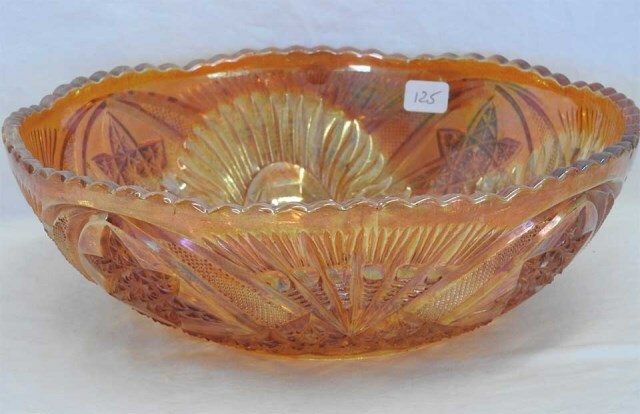 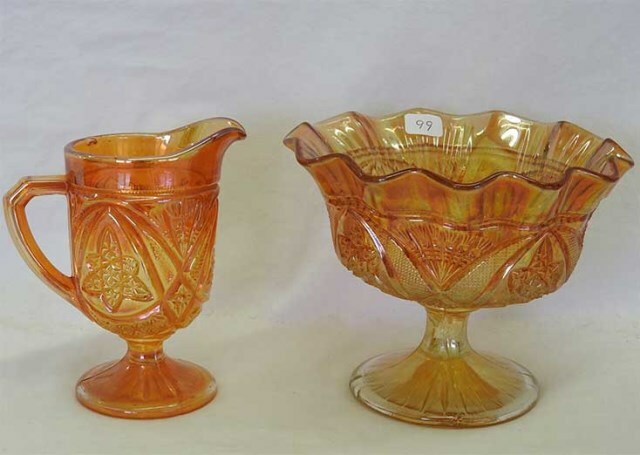 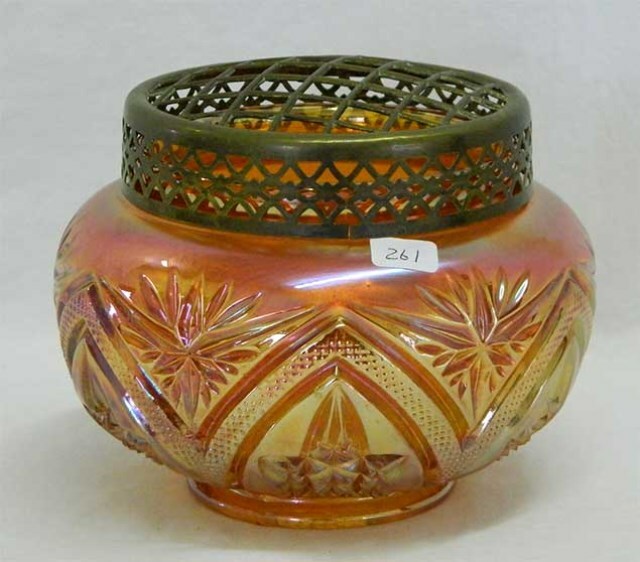 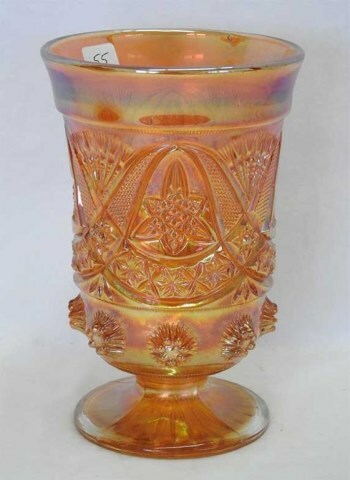 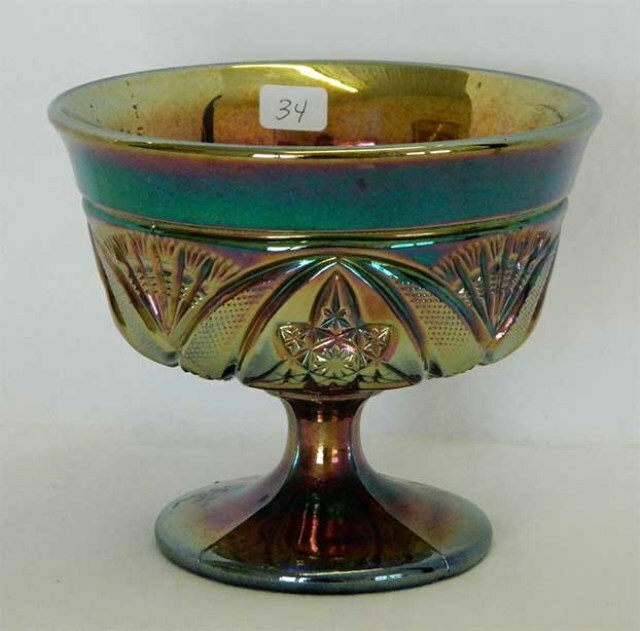 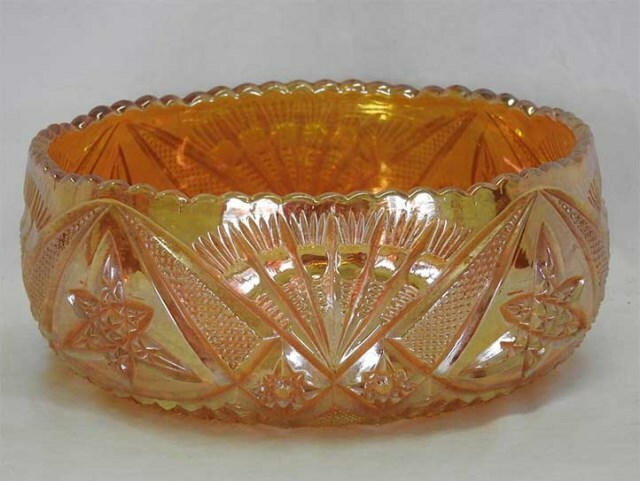 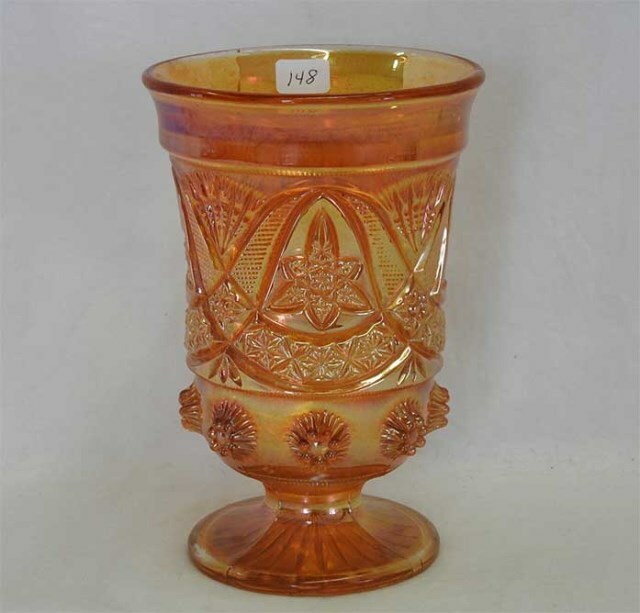 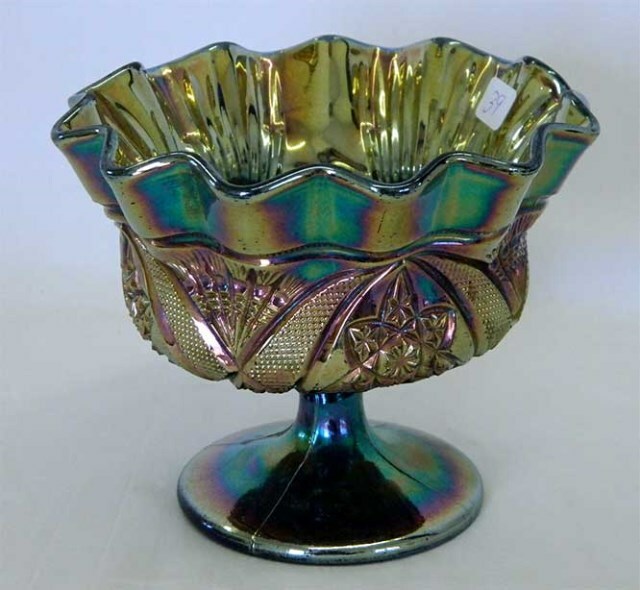 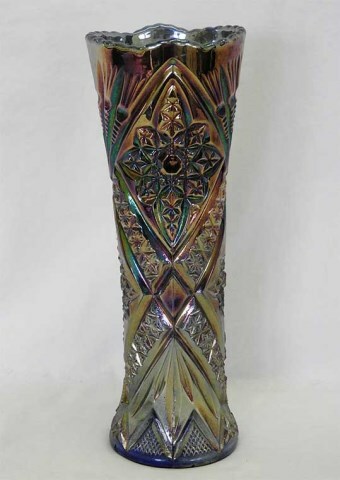 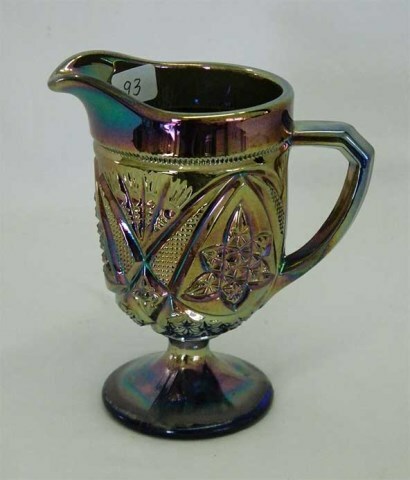 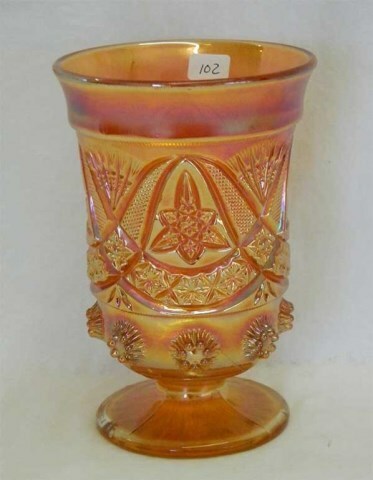 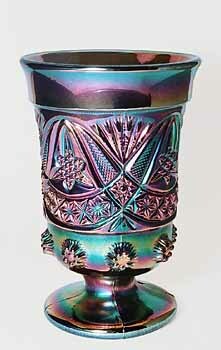 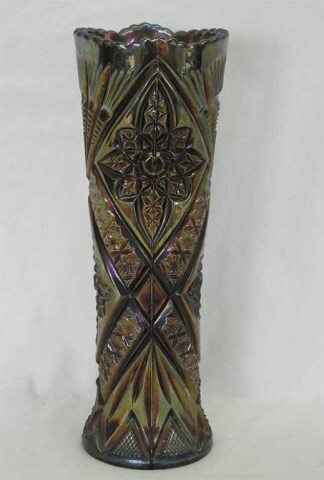 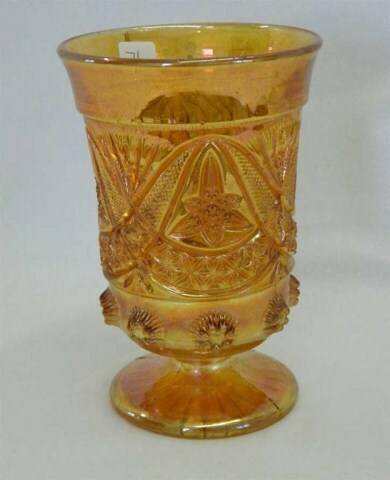 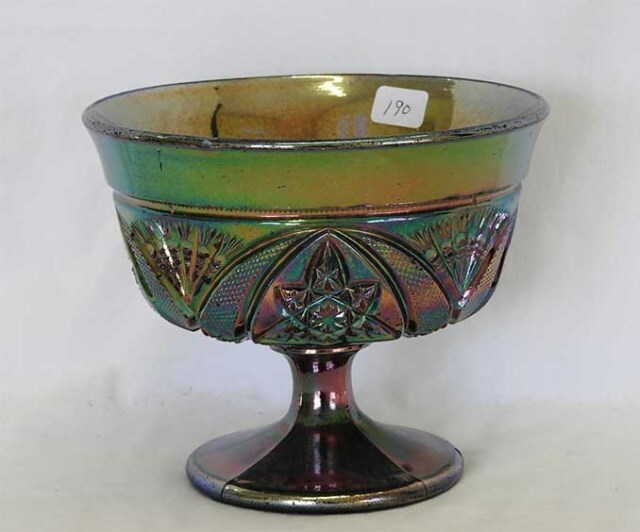 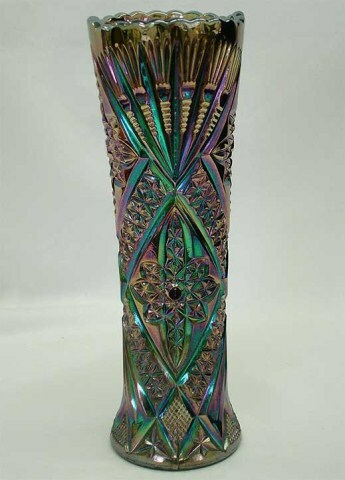 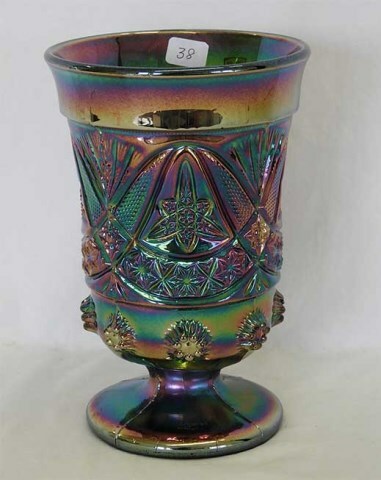 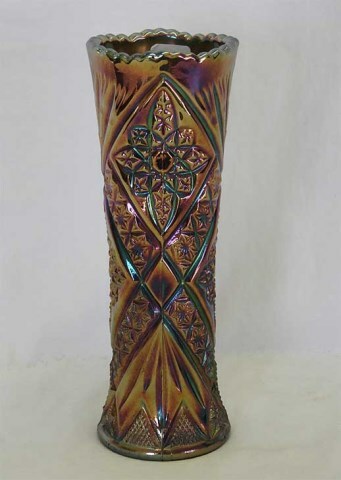 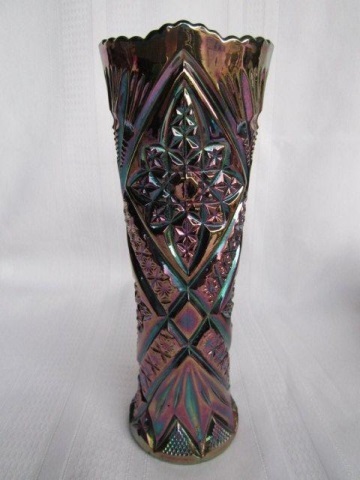 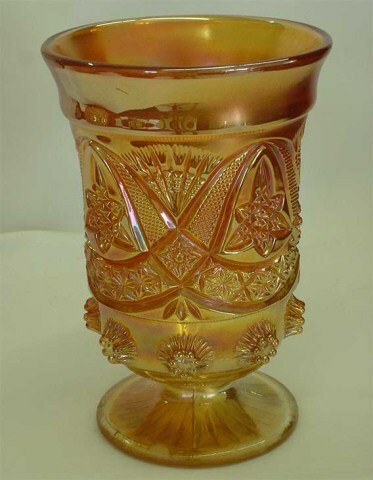 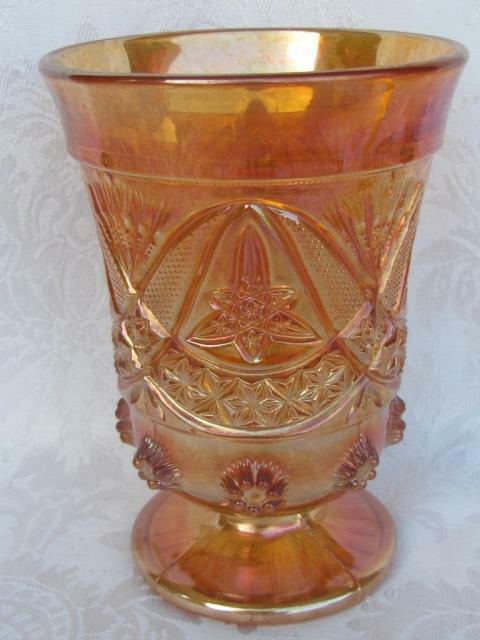 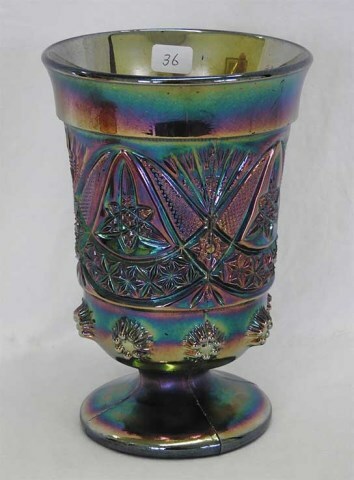 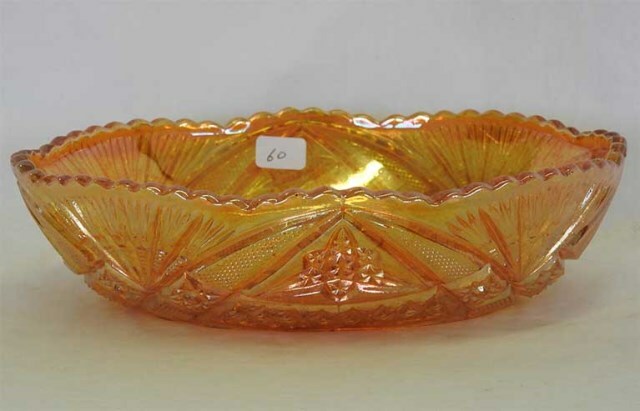 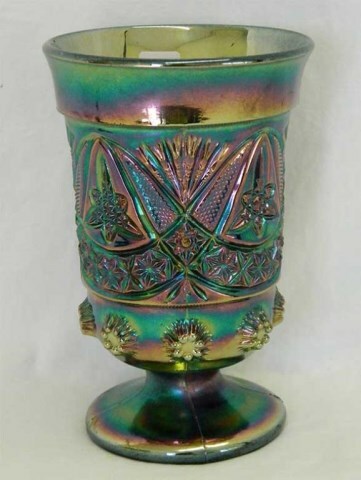 Early Carnival Glass collectors did not know either the pattern or shape of the celery vase on the left, so began calling the pattern Cathedral and the shape as a chalice–and it is still sometimes identified that way. 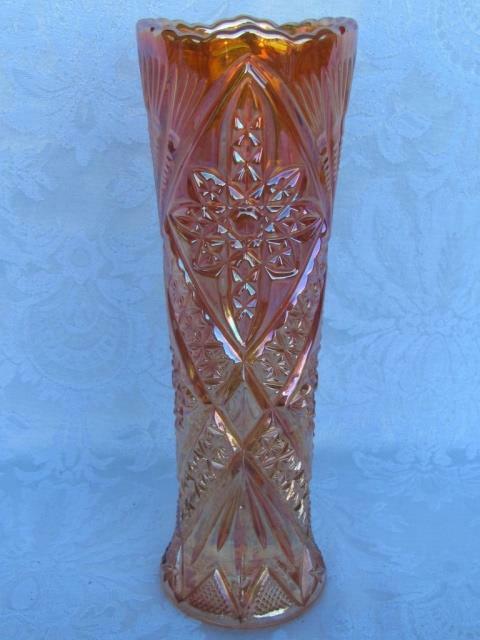 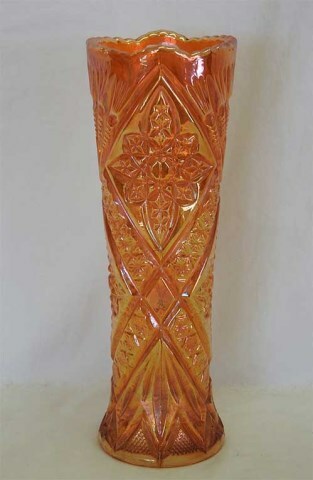 It has only been in relatively recent years vases have appeared. 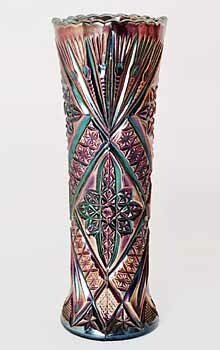 While the pattern has traditionally been credited to Brockwitz, research shows that Eda and Karhula also made the pattern. 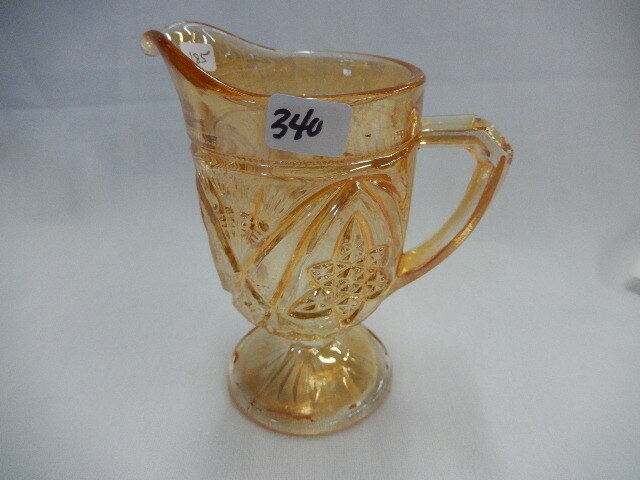 Curved Star was produced in a large range of shapes, including this stemmed Creamer and Sugar. 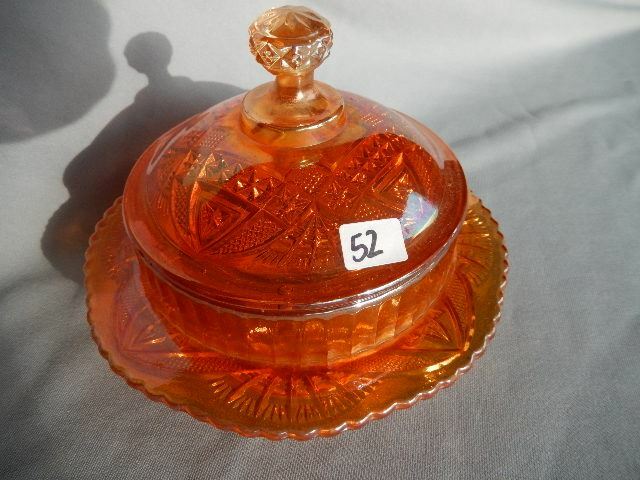 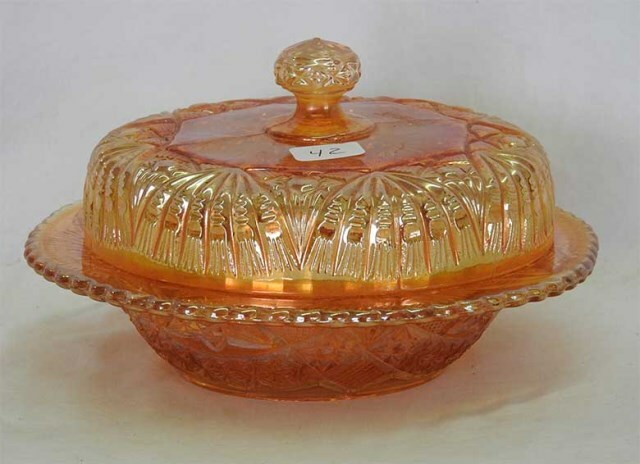 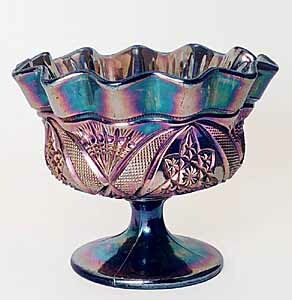 The open stemmed sugar is often identified as a compote. 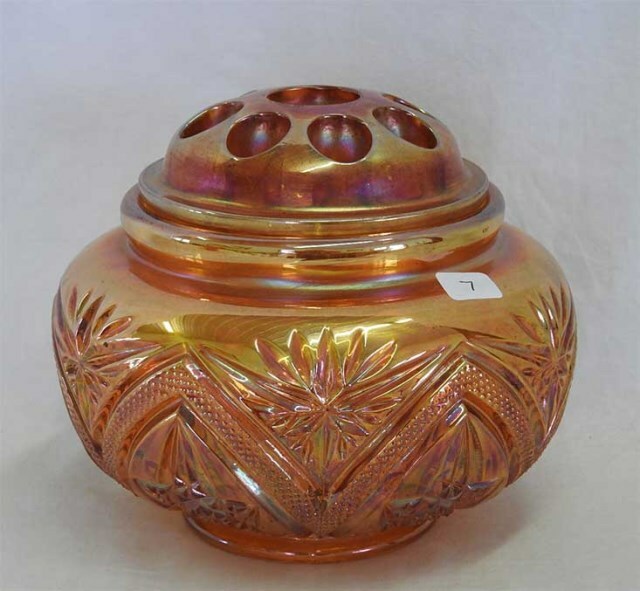 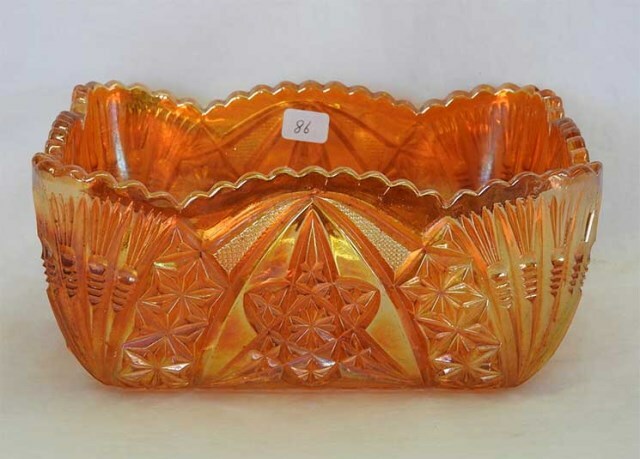 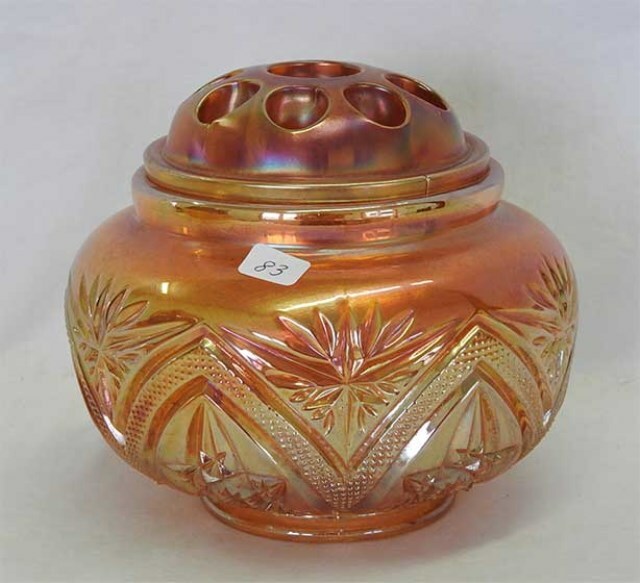 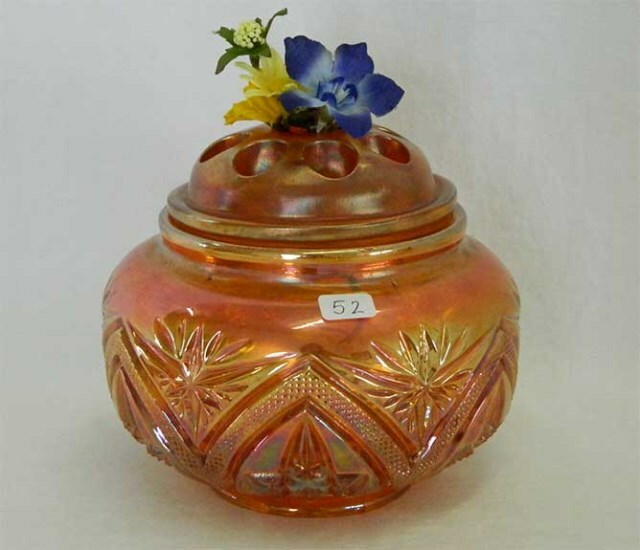 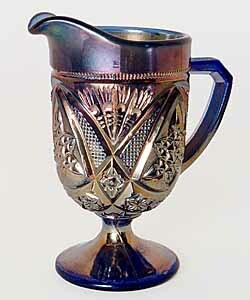 The sugar bowls are found with a pattern on the inside called Headdress. 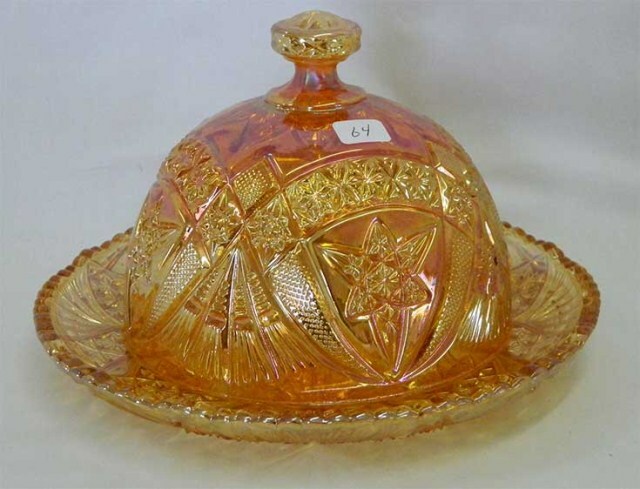 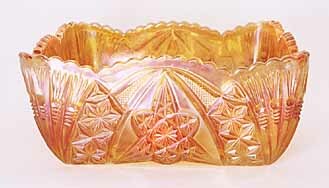 Butter dishes are known in two shapes although one is actually a cheese dish. 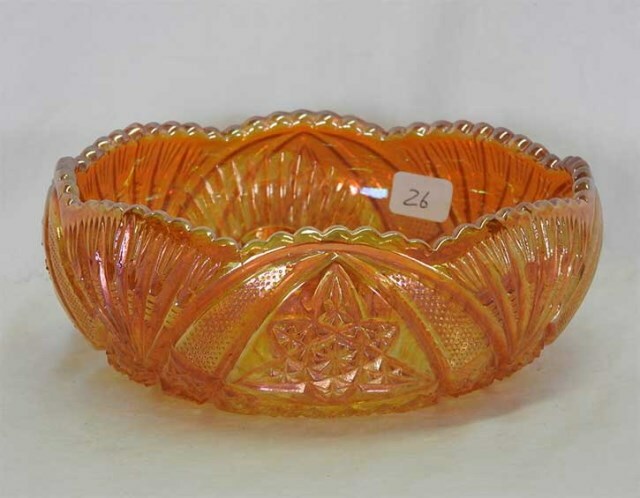 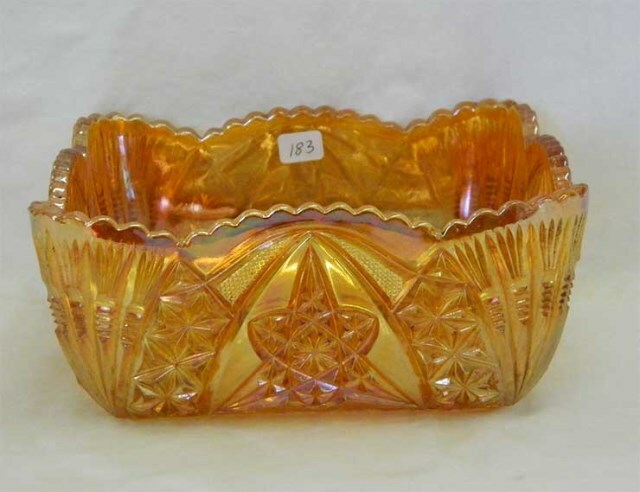 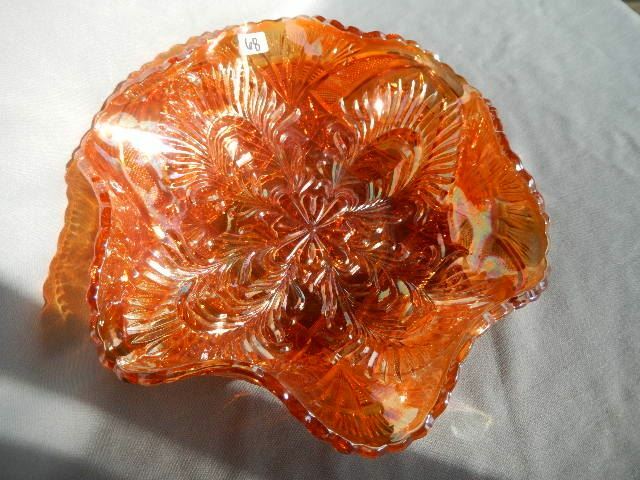 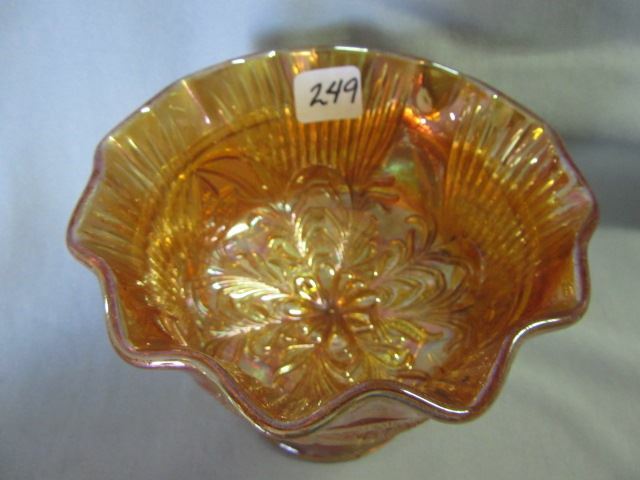 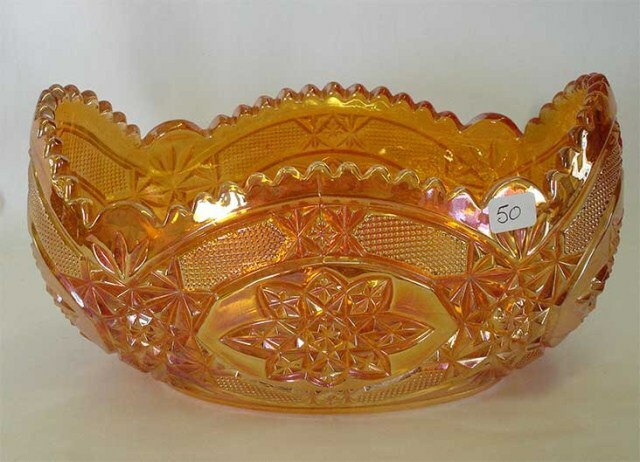 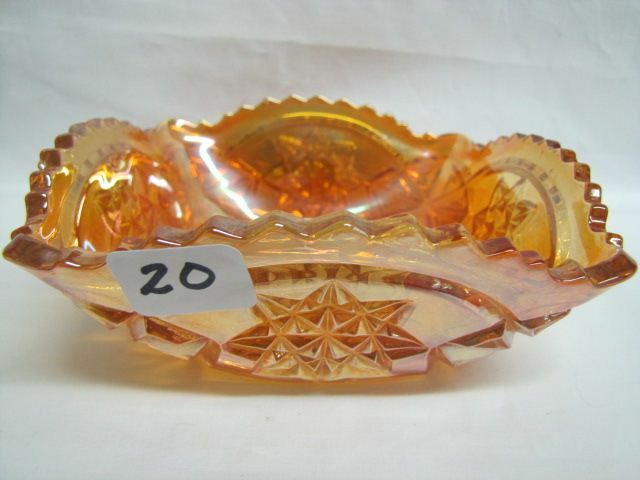 Rosebowls are fairly common in Curved Star. 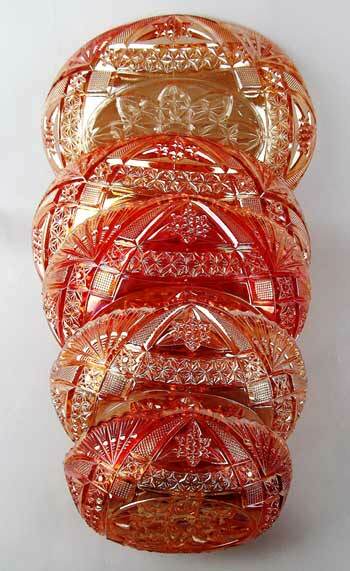 They vary in size from about 4 inches to about 7 inches across. 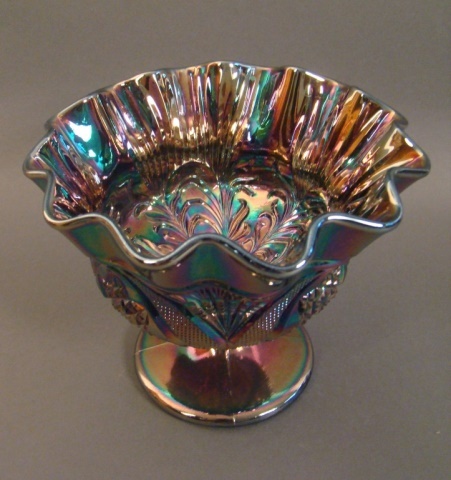 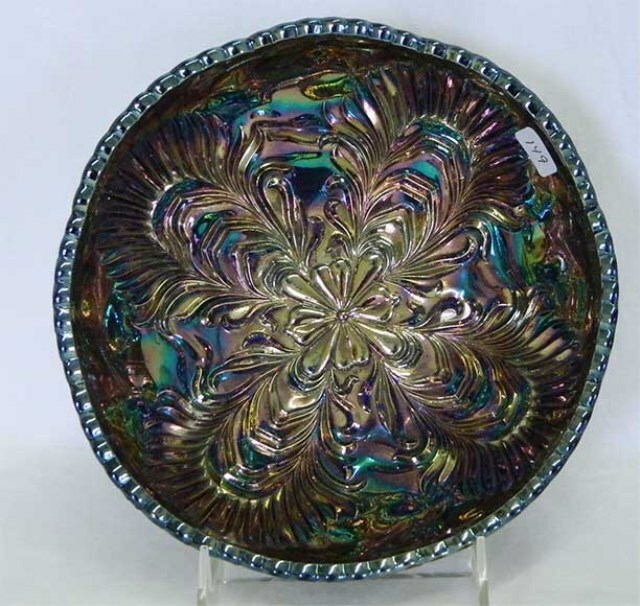 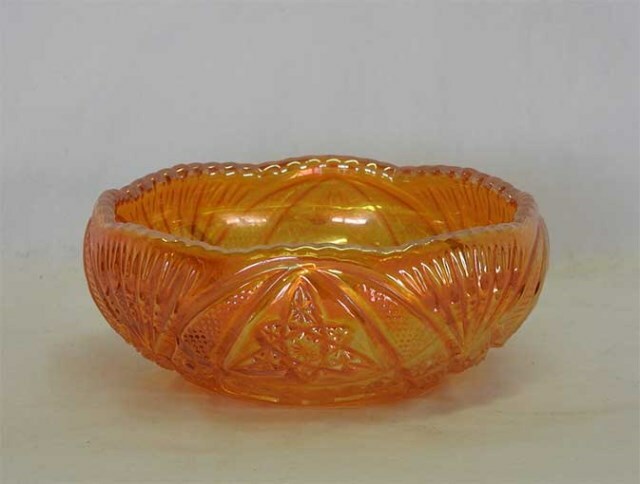 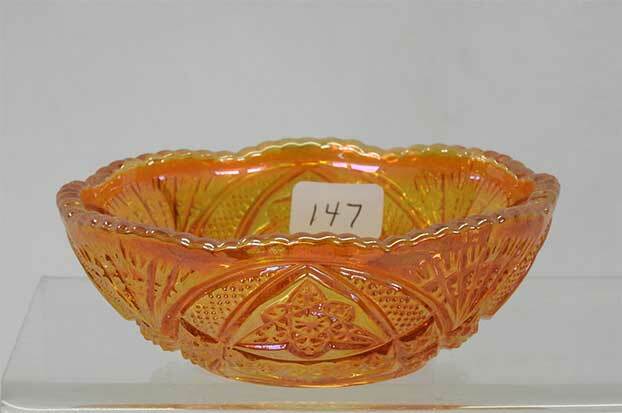 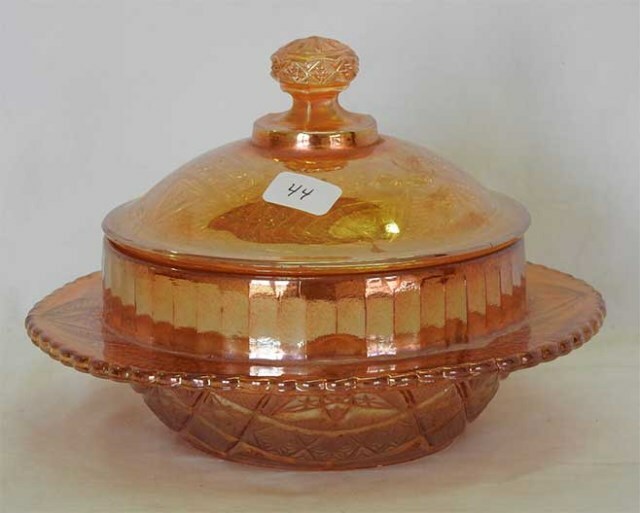 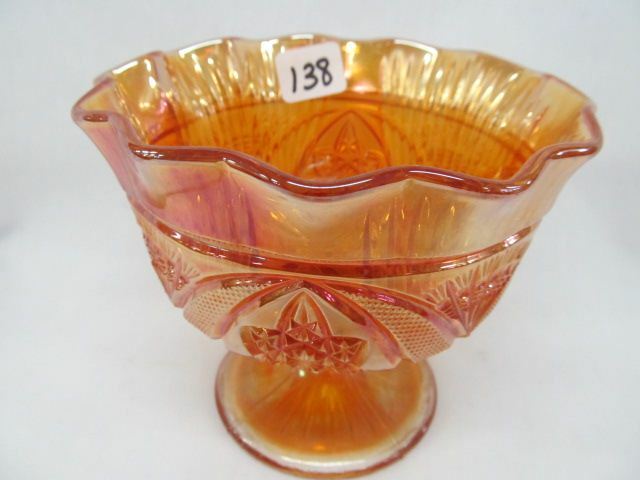 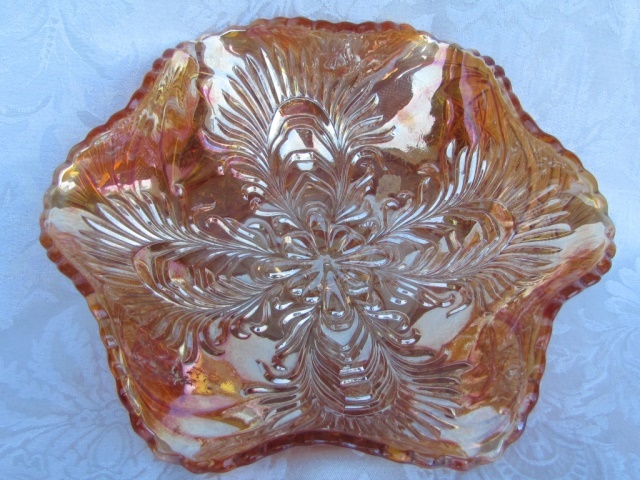 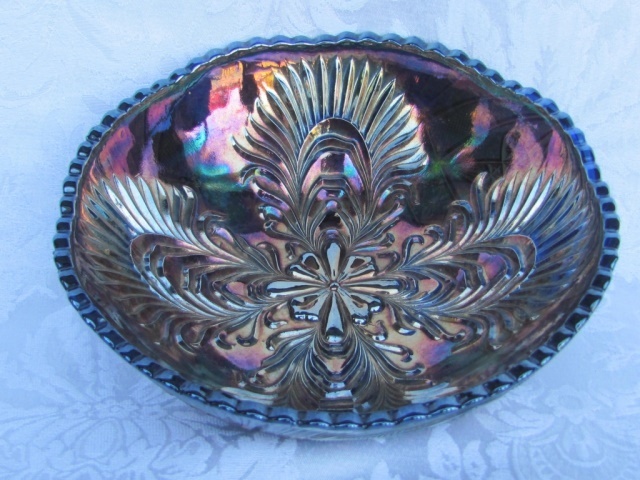 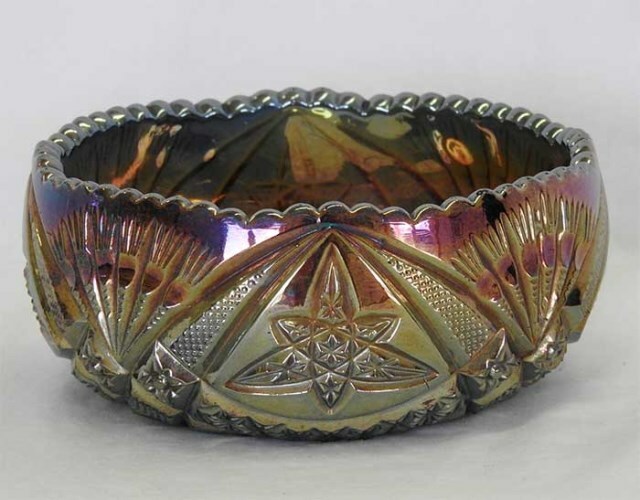 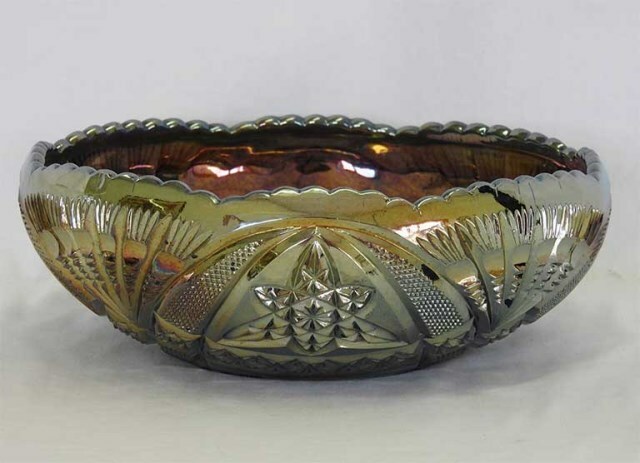 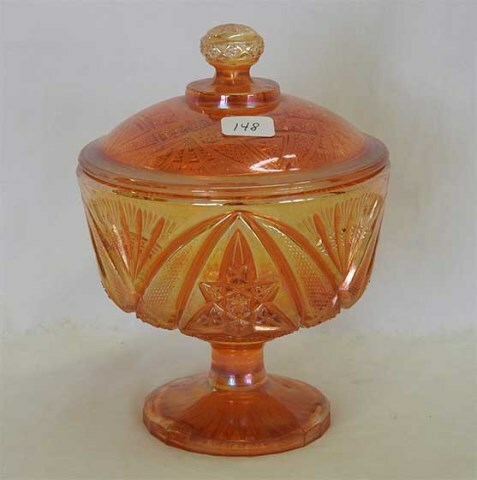 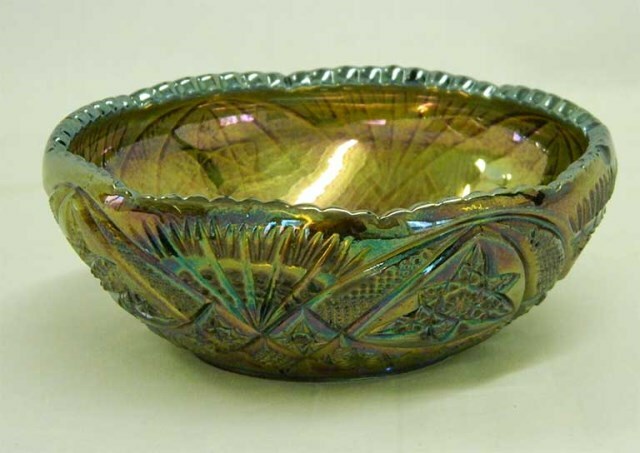 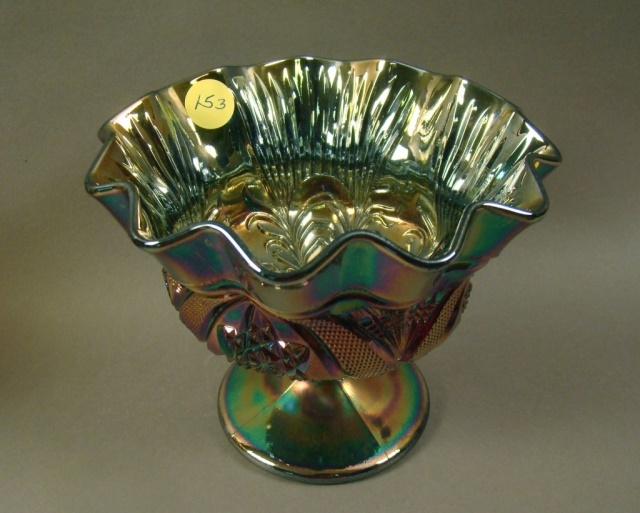 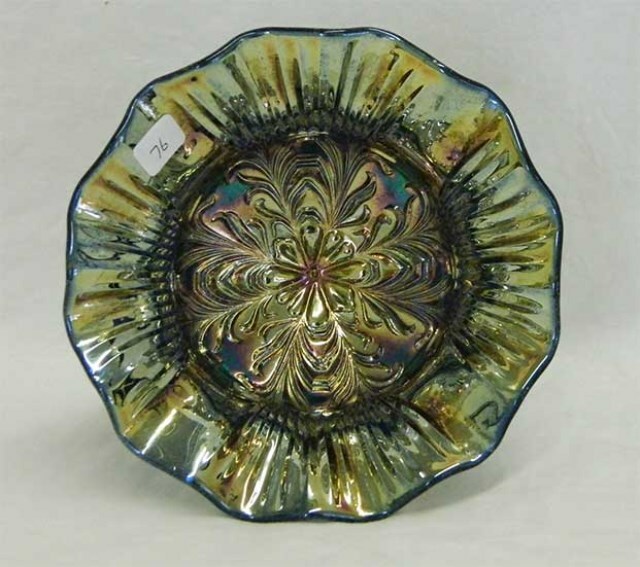 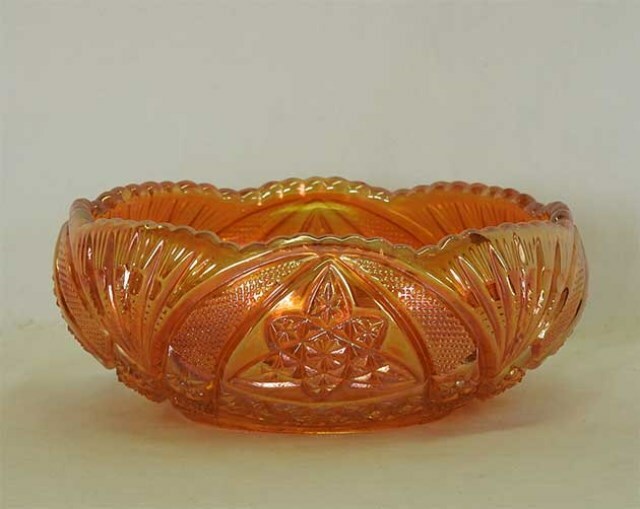 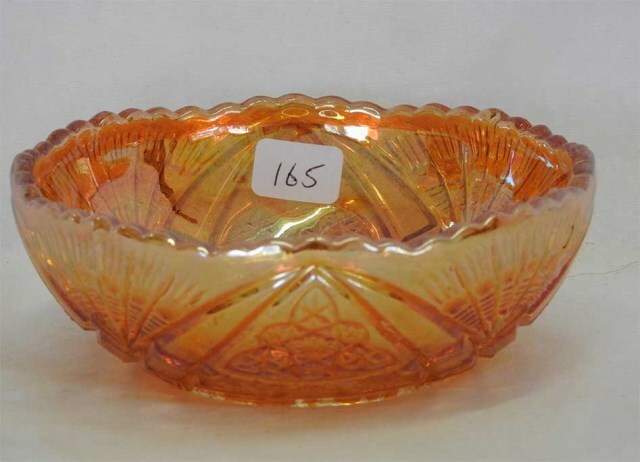 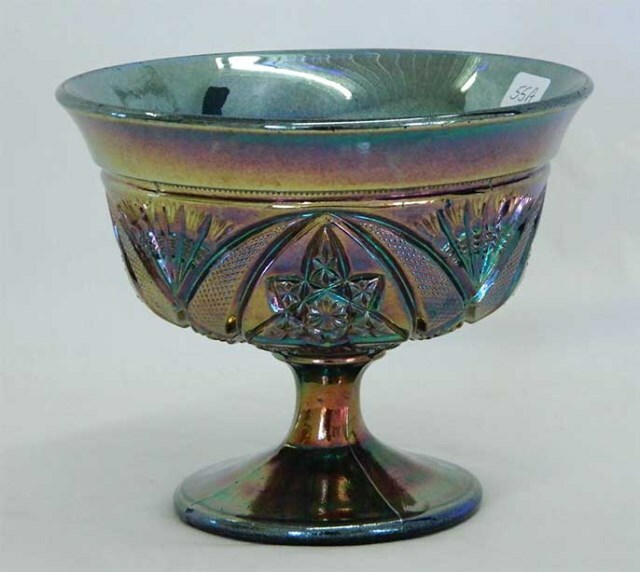 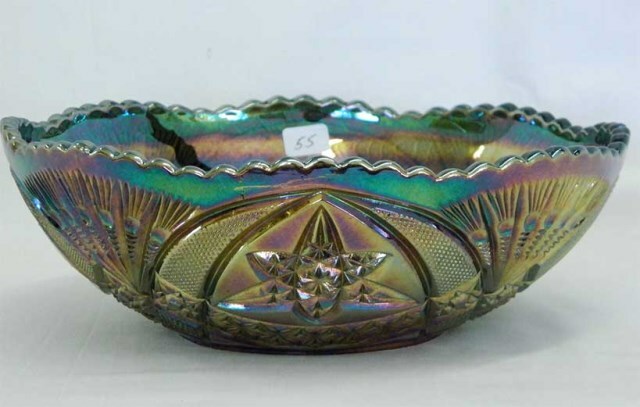 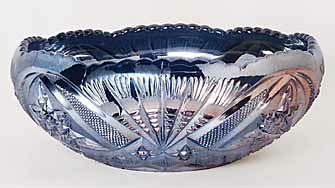 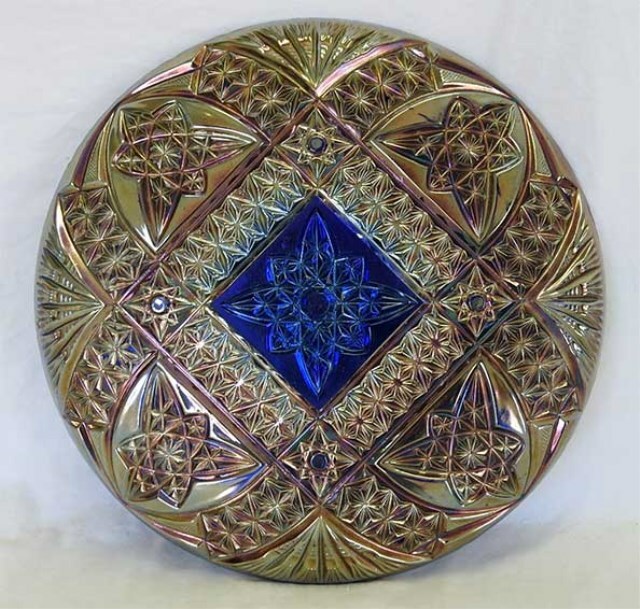 Bowls are less often seen; the square bowl above is quite unusual. 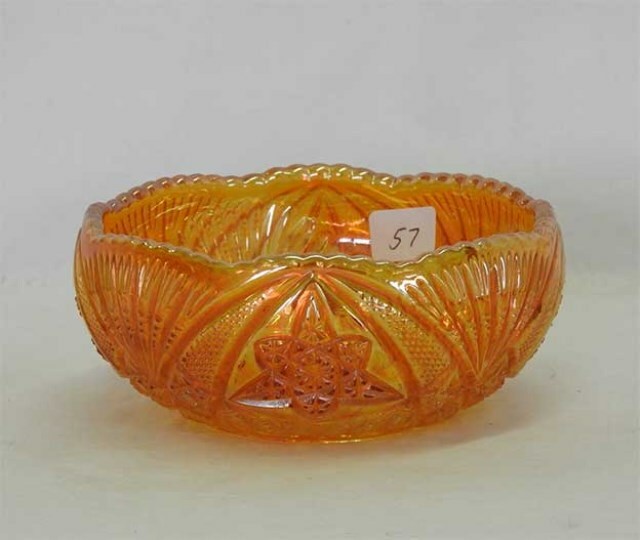 In marigold, it sold for $300 in 1999. 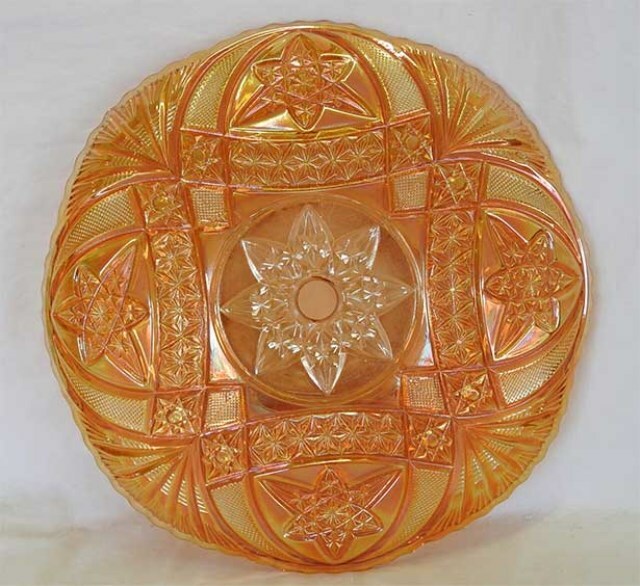 The Curved Star epergne is quite rare. 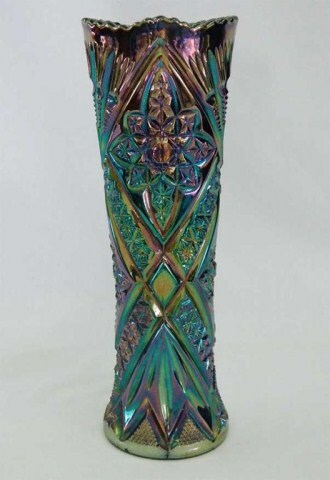 This example is courtesy of Ed Kramer. 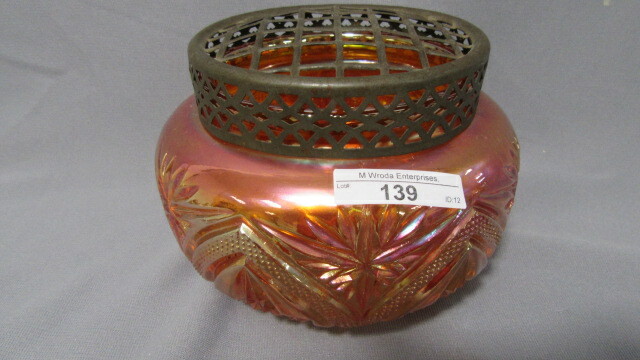 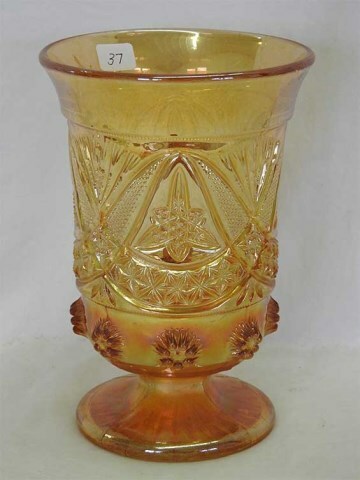 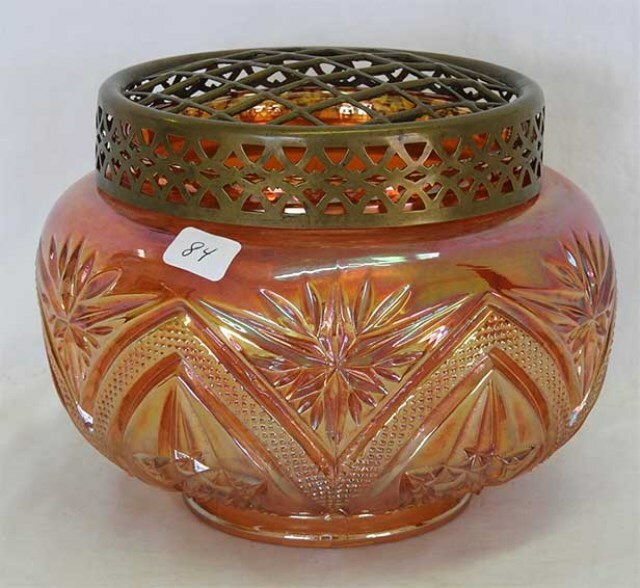 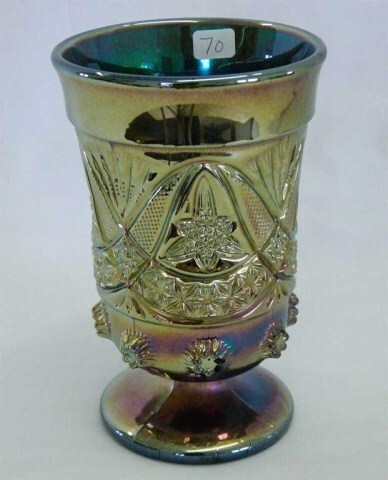 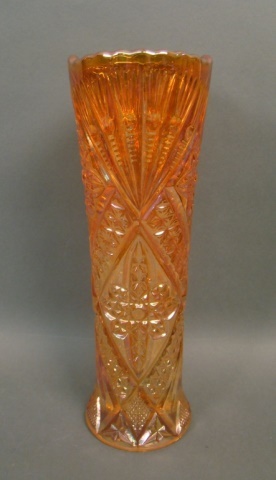 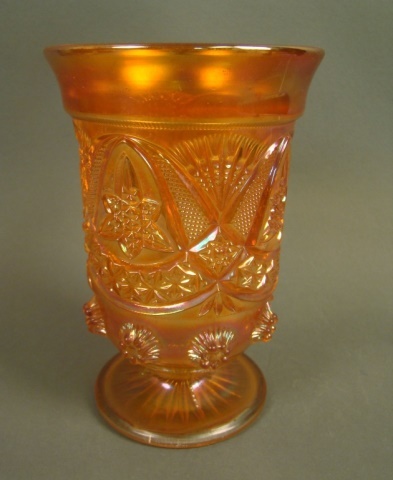 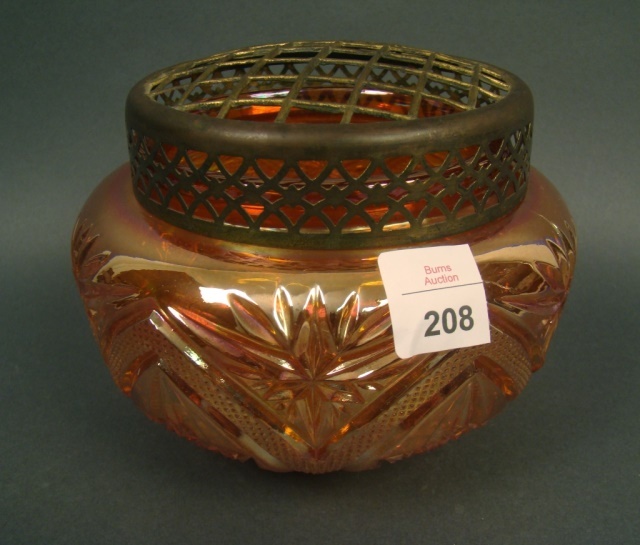 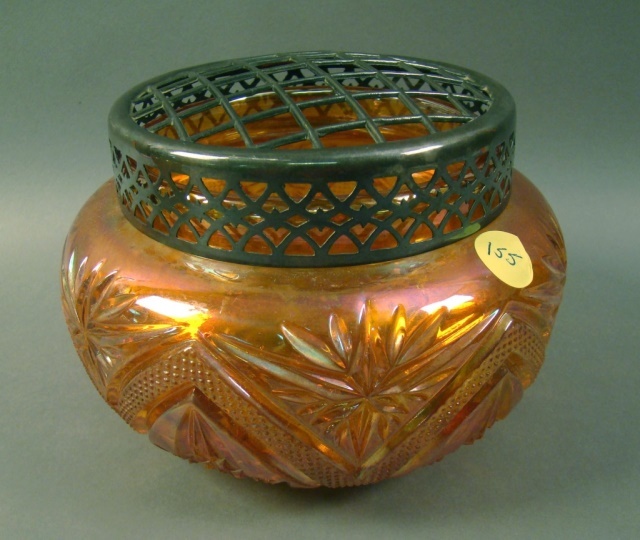 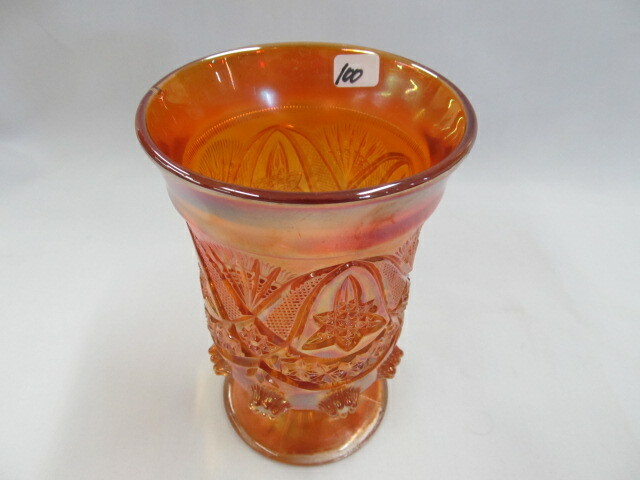 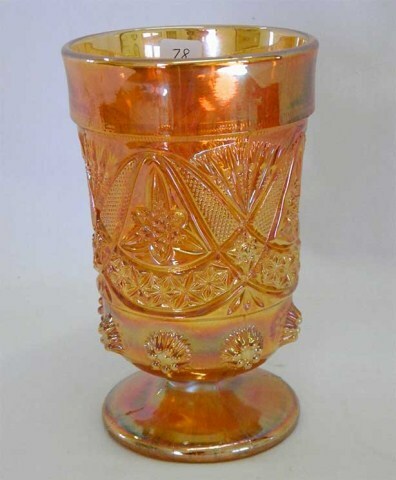 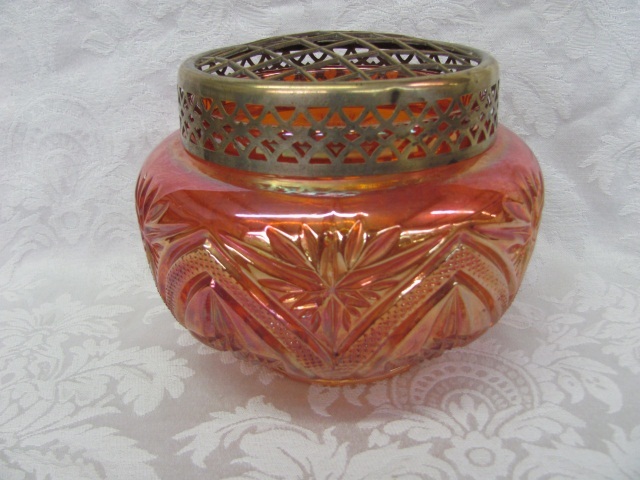 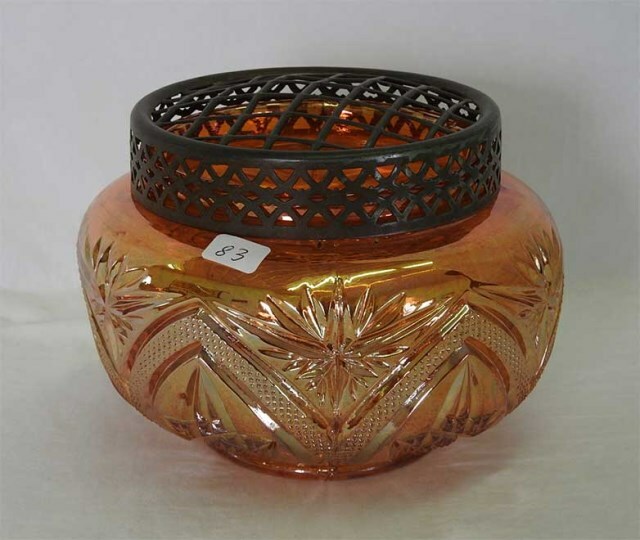 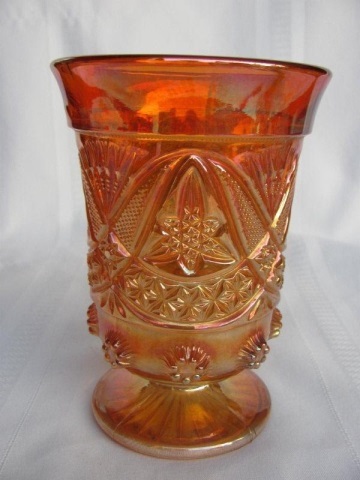 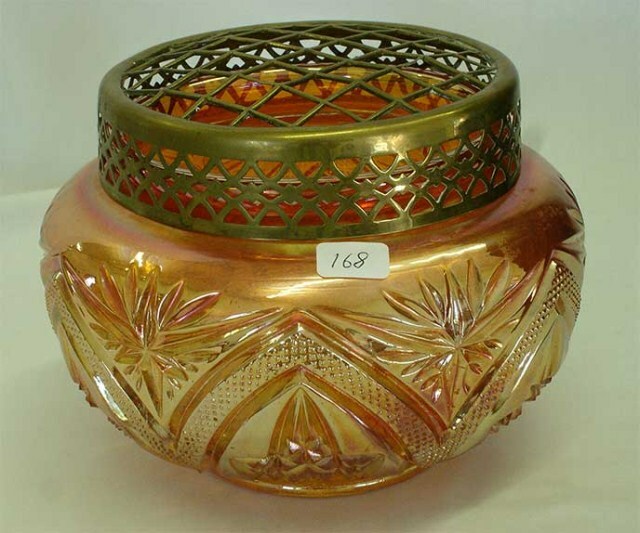 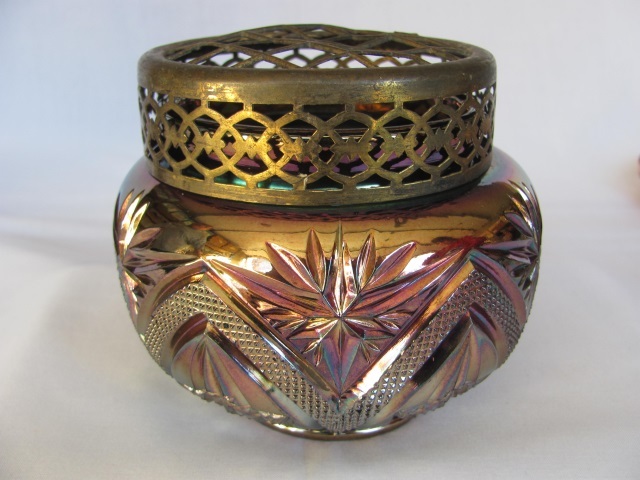 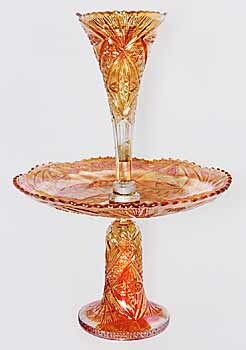 Note that the top is the same as the candlestick holder–another example of how some European manufacturers made pieces do double duty. 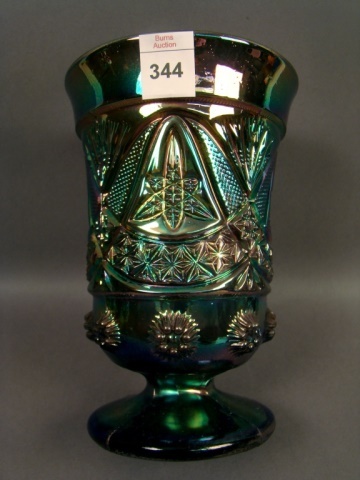 The candlestick holders were identified as Star and Fan when they sold for $205 in 1993. 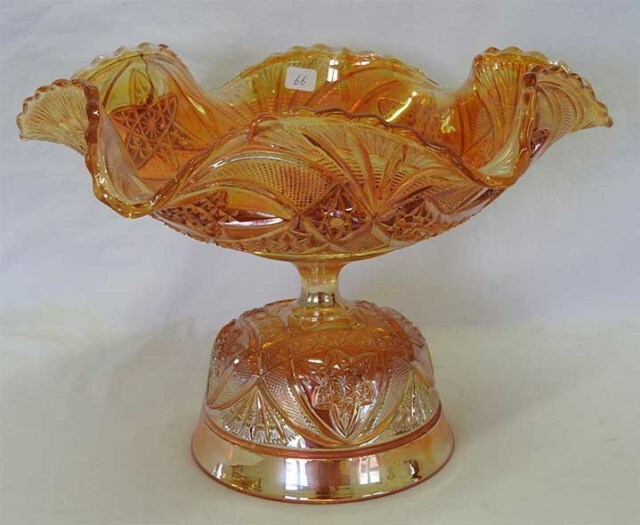 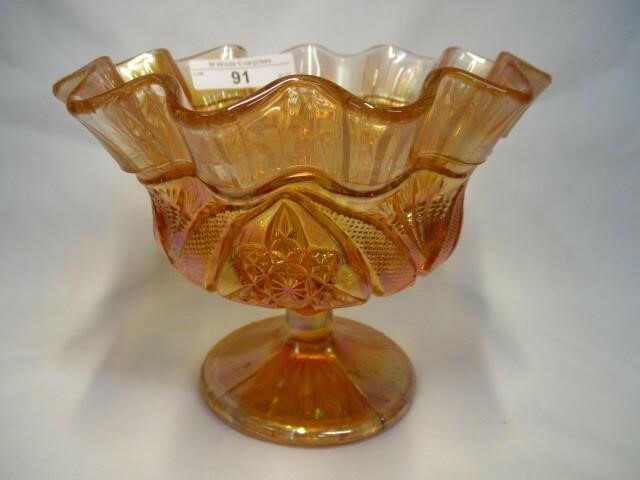 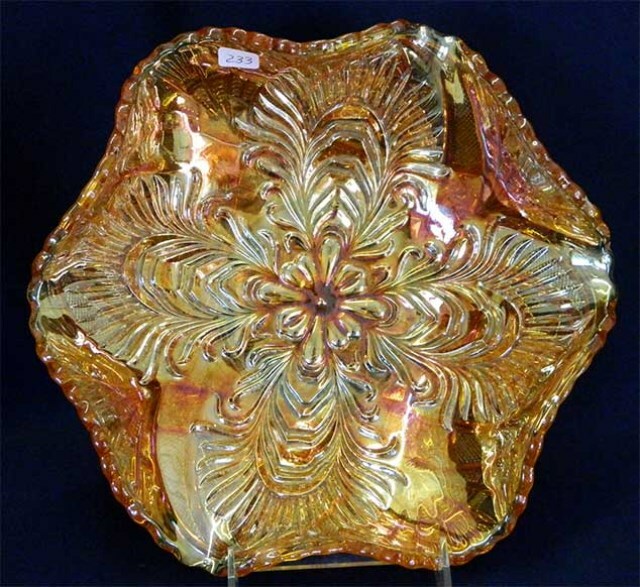 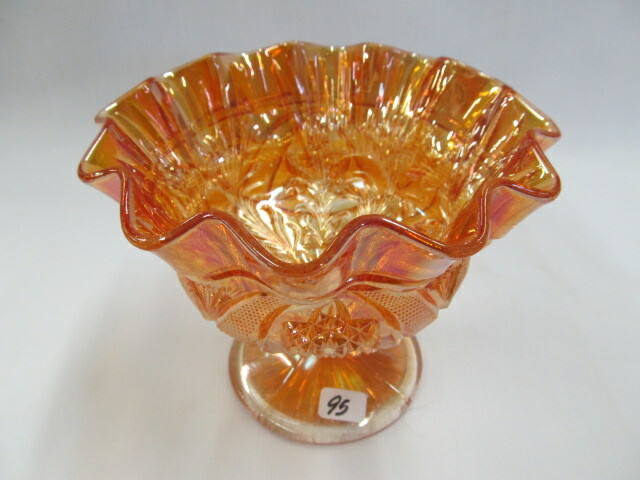 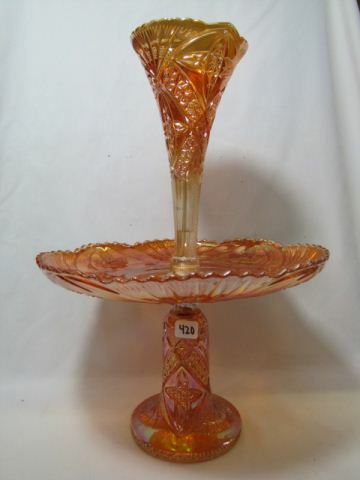 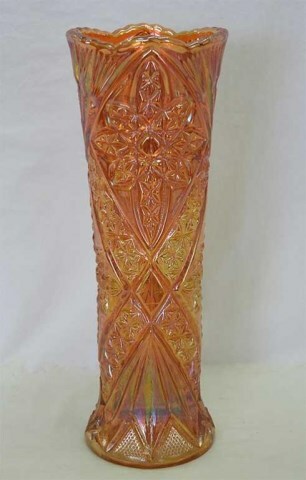 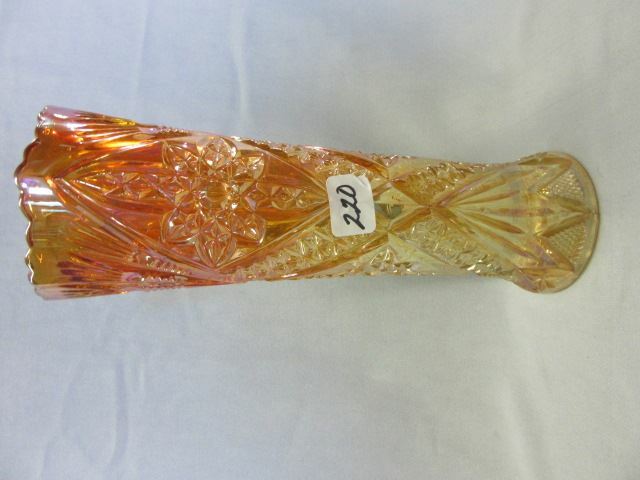 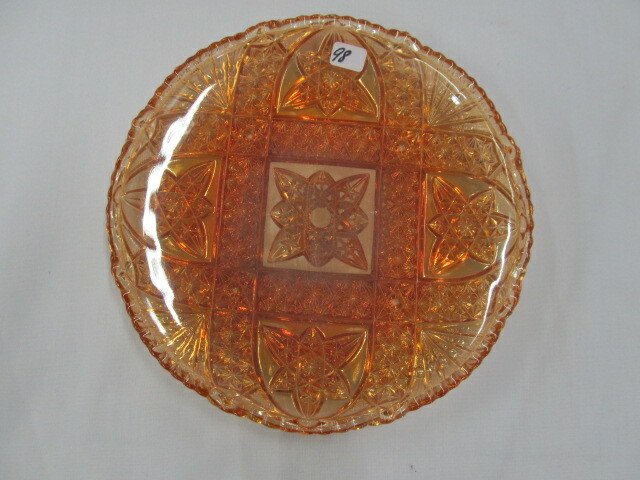 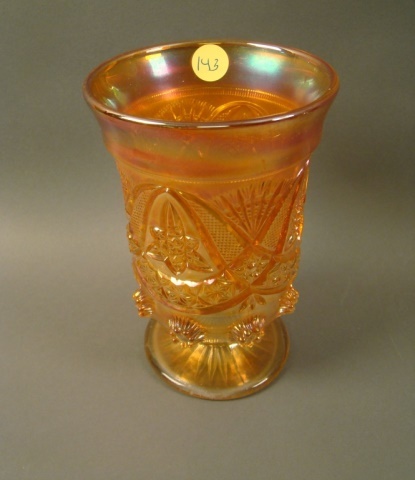 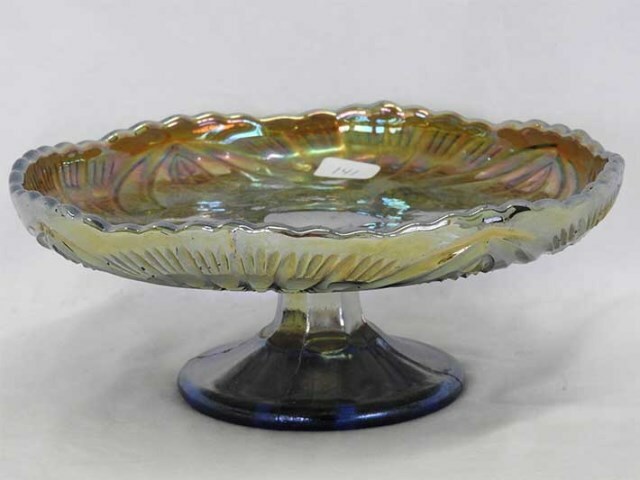 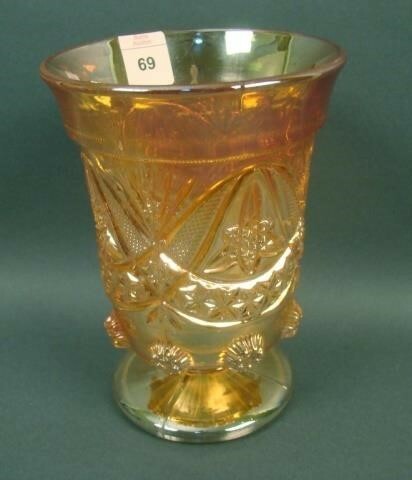 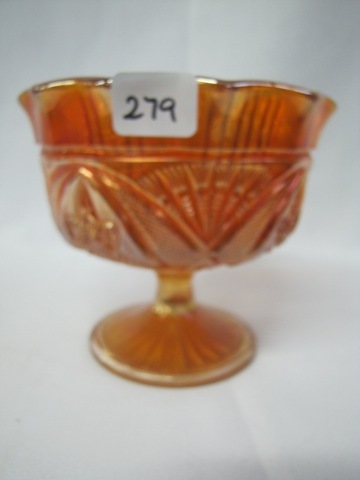 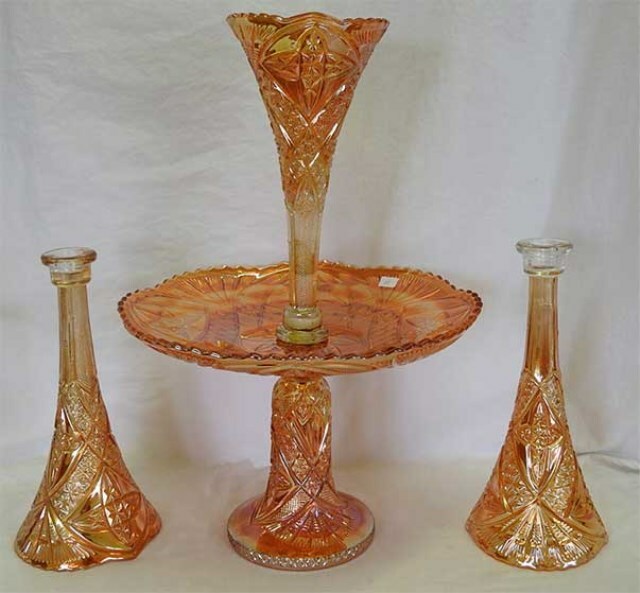 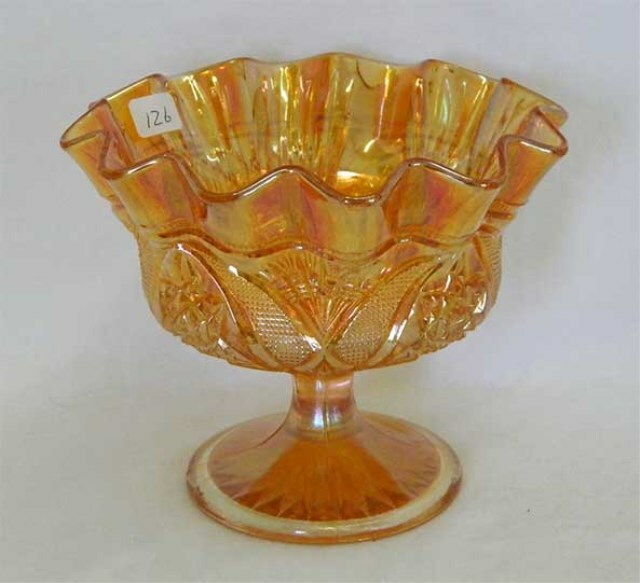 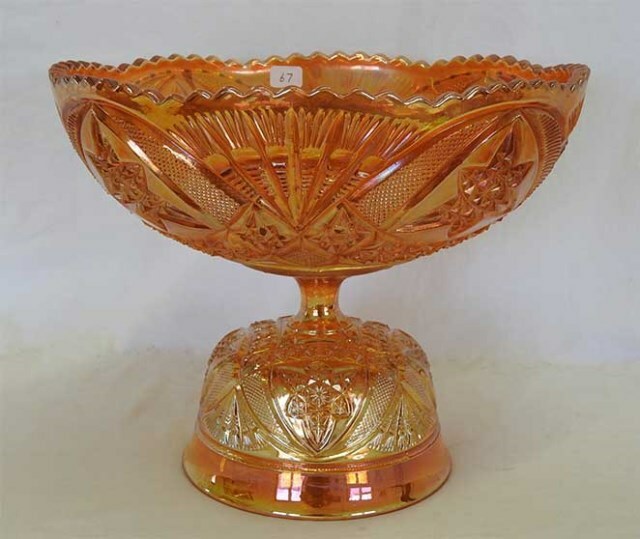 A marigold epergne sold in 2003 for $1,100; another in 2004 for $350, and another in 2011 for $550. 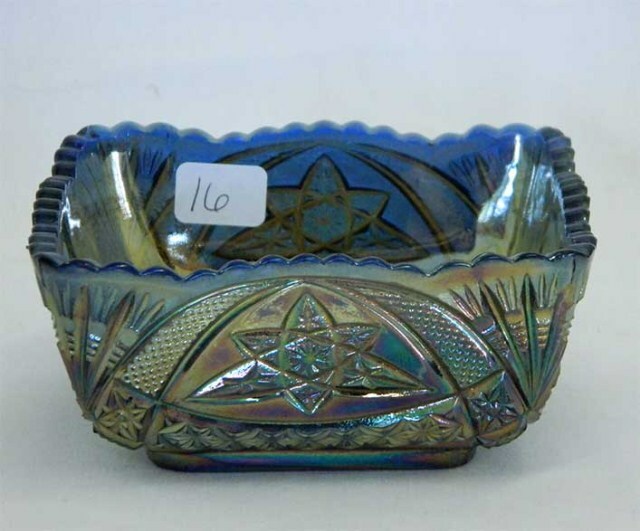 King Hoppel sent me this photo of a graduated set of Curved Star bowls. 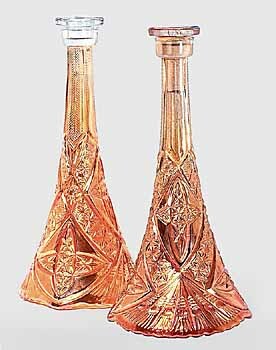 Who knew they made so many sizes?